It’s one thing when it’s been a big snow year and you know it’s coming. It’s another when the runoff comes unexpectedly, as it did mid-May for us here on the Yampa in Colorado. No one was holding out much hope for a decent high water year this season. But for those worth their weight in nose plugs, all that changed with a drop of the barometer. While everyone knew the rains were coming, no one thought it would lead to a record-setting spike for the date. Forecasters called for a mid-week peak of 1,700 cubic feet per second (cfs). But the deluge brought down reams of snow with it, causing Wednesday morning’s flow report read a whopping 2,900. It rose to 3,600 by early afternoon, a high peak for even a big snow year. And that brought out the big water dogs. They crawled out of the woodwork like telemark skiers emerging from the forest, congregating at the parking lot with grins as big as the river. People you hadn’t seen all year were instantly back in your social circle as if no time had passed at all. Of course, this also means there wasn’t a lot of warm-up. For those who hadn’t been in their boats yet, the season’s first stroke led straight into the ligament-loosening Charlie’s Hole. It was like hopping on a bronc cold turkey or biking a Century ride off the couch. Dormant muscles and synapses were called into action pronto, taking a test they hadn’t studied for. While this posed no problem for the youngsters, the vertebrae of the veterans quickly voiced their concerns. In a world-class and beefy hydraulic like the C-hole, you take what it gives you. If you’re a good boater, it’s relatively benign. You’re not going to get killed. Just thrashed. The worst case scenario, aside from blowing out your shoulder, is missing your roll taking a swim. Like in the surf, the better you are the less severe the thrashing. Good surfers know how to duck-dive waves, avoid pearling and outsmart close-outs. Similarly, kayakers keep their elbows in a tight box to save their shoulders, know how and when to lean, and have their rolls as a backup. The better you are, the less you flip and get chundered. What’s bad is getting exhausted during your ride and then flipping. Then you have to roll when you’re tired, oftentimes without a breath. Another bummer is sticking your roll, only to find that you’re still in the hole. Most often, when you flip you flush out and roll downstream of its grasp. But the sticky part will sometimes keep you. You’ll roll up and still be in its clutches. Then the only solution is to, next time you flip, reach down with your paddle while upside-down to catch the flowing water with your blades, which pulls you out. And all this is fun, you ask? Well, in a sadistic way, yes. While onlookers might think you’re crazy — and to a degree, you might be — it looks worse than it is. It’s a puzzle — figuring out how to surf the thing without getting pulverized. When front surfing, you lean back and edge your boat to avoid getting your bow sucked under and visiting Atlantis. If your sideways, for the love of God, you lean downstream so your upstream edge doesn’t catch. Otherwise, it’s hasta pronto, emphasis on the pronto.You’ll flip faster than a pancake. You’re multi-tasking the entire time, balancing rudder pressure, side, and forward and backward leans, stroke strength and cadence, and more. It’s a hockey shift, Manic Training session and bike climb all in one. Above all, you learn to stay away from the hole’s far river left side. That’s the sticky part. While the right side is more of a wave, the left is uglier, less predictable, more munchy. That’s where people swim, even the good boaters. It’s also the side that flips inflatable kayaks and rafts, both of which happened on the same high water afternoon. If you’re lucky, you’ll emerge unscathed. You’ll go in, bounce around for a while, maybe try a few moves, and then get spit out like an orange seed. Conversely, you’ll get throttled, rolling up with water coming out of every unprotected orifice. How good is it here? 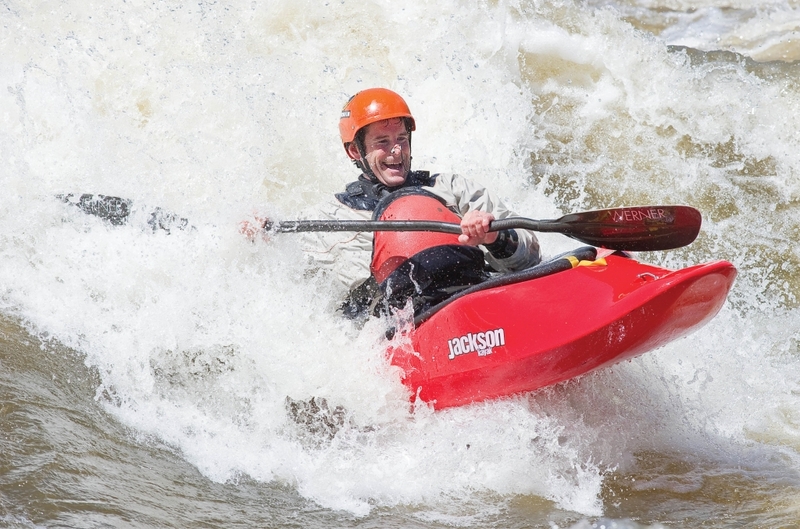 Enough that former world freestyle champions Nick Troutman and Emily Jackson swung through town in their RV for four days, with 17-month-old son Tucker in tow, just to hang out and paddle between competitions. Alas, the pill to swallow is that with the river flowing 2,000 cfs higher than average, peak runoff is now over. But like any ski year, you remember the highs more than the lows. So you rally while it’s there and fix the lawn mower later. The honey-do list will still be on the fridge in July; not so the high water. All you need is for your shoulders to outlast the snowmelt.